I read a list of the bucket list items to try in Boston, and near the top of the list was Oleana's Baked Alaska ($14). This stuck out to me for a few reasons: Oleana wasn't too far away, and what the hell is baked Alaska? The dessert is made with six ingredients: ice cream, sponge cake, egg whites, sugar, vanilla, and salt. A scoop of ice cream on a bed of cake is smothered in a generous layer of meringue and baked in an ultra-hot oven. A few minutes later, out comes an irresistible confection, one with a piping hot exterior, like that of a toasted marshmallow, encapsulating the ice cream, which remains frozen. It’s an ice cream dessert that is actually baked. We didn't care to eat inside since we only wanted dessert, so we had to convince them to get this dish to go. You can see why this could be problematic. You need to eat it almost as soon as it's served. As soon as it was served to us, we hopped in the car, headed home and raced up the stairs. Oleana's Baked Alaska is built upon a chewy coconut macaron base. 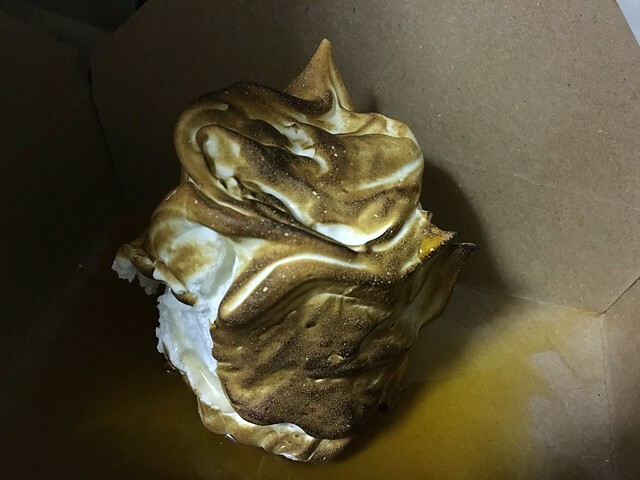 Atop that is a housemade coconut ice cream, and it's all wrapped in a torched meringue. I loved the chewy macaron, which gave some nice texture. 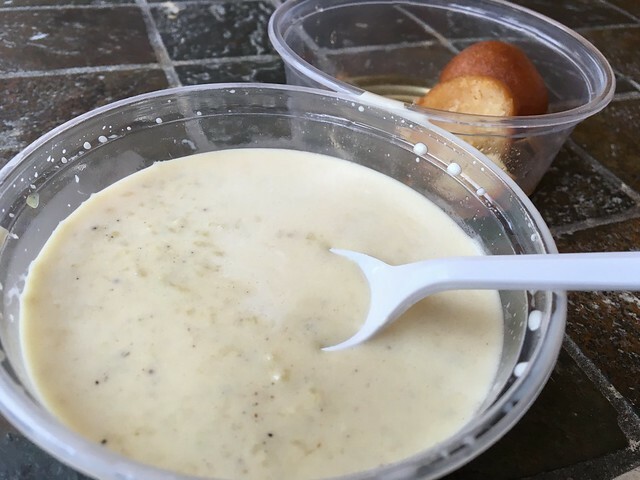 The odd part is a tangy, bitter passionfruit sauce. It definitely tones down the sweetness, but it also made me pucker a bit. It's a pricey dessert, and I could do without the passionfruit sauce, but the macaron, ice cream and meringue were a unique flavor combination I've never had before. I think it's definitely something to try! 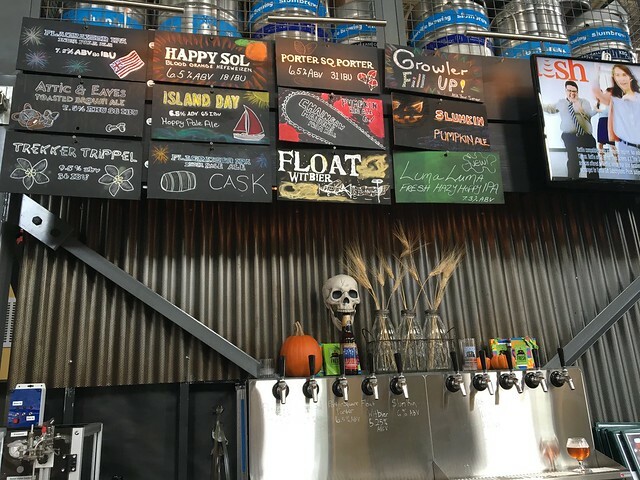 I think the first Harpoon beer I ever tried was their pumpkin cider years ago at Apothecary Ale House. I was, of course, a fan. 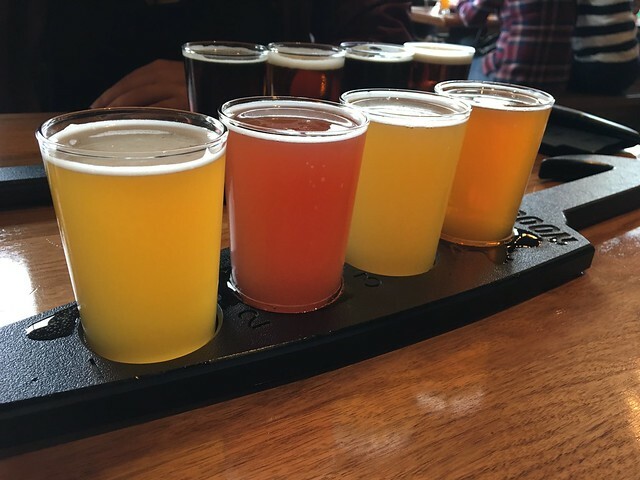 And while most of my visits in Boston were to smaller breweries, I figured it couldn't hurt to throw a larger one in there, too. 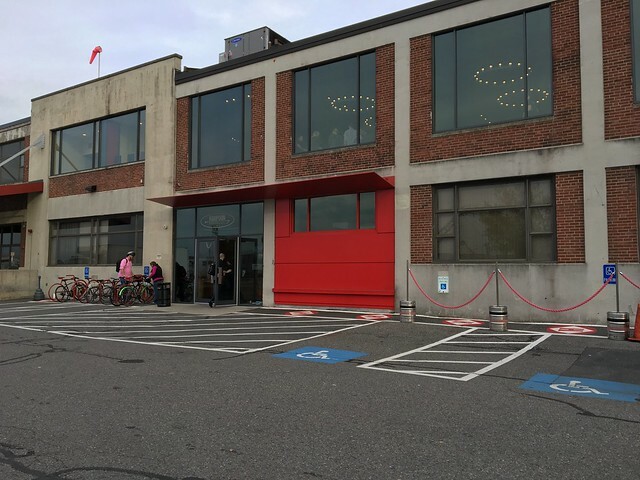 Harpoon is clearly on a different level, just judging from the sheer space. 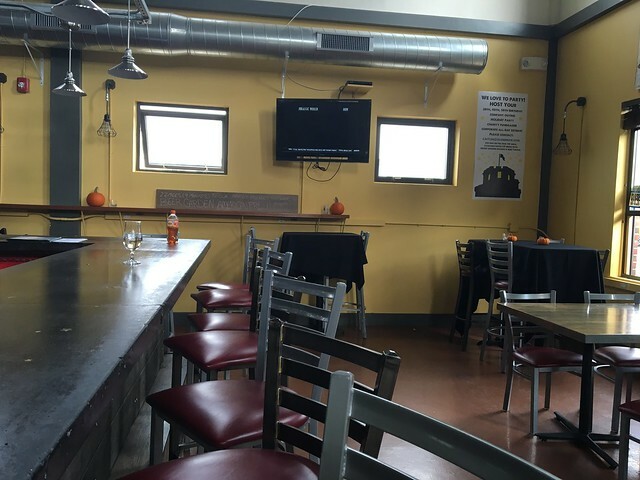 There is a huge dining area with tables lined up, brick walls, and neat lighting fixtures. On the flip side, it also makes it a little more impersonal. 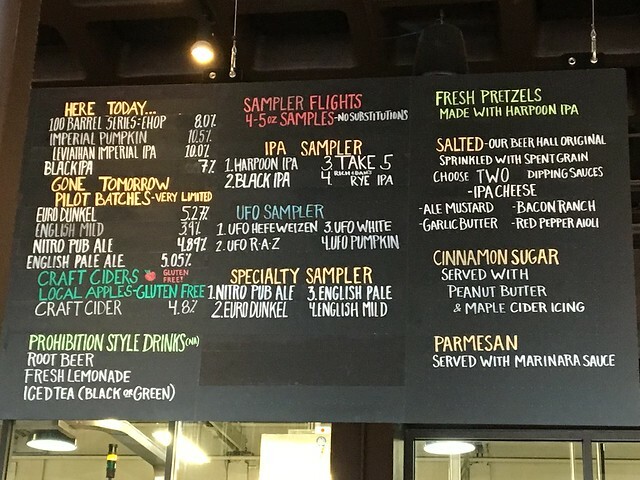 I ordered the UFO sampler, which came with the UFO Hefeweizen, UFO R-A-Z, UFO White and UFO Pumpkin. The Hefeweizen was light, crisp. 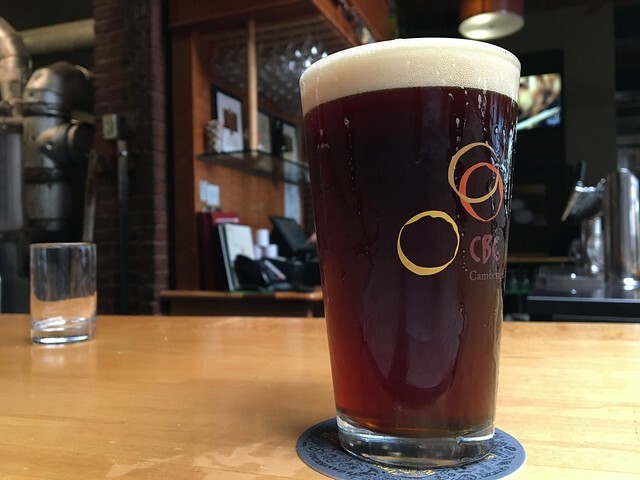 The R-A-Z is a raspberry wheat, so yes, that is delicious. The white was a bit spicy. And the pumpkin was an OK pumpkin. There was beer everywhere. I don't know if they spilled when they were carried over or what the situation was, but the attention to service here was just not what I had been used to. The beer, though, tasty. 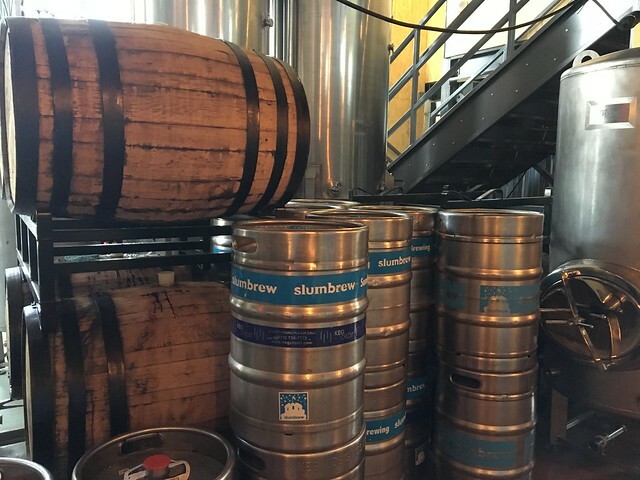 I first heard of Somerville Brewing Company when I was at Kaitlynn's friend's apartment, and he had some local Slumbrew beers that we drank while playing board games. 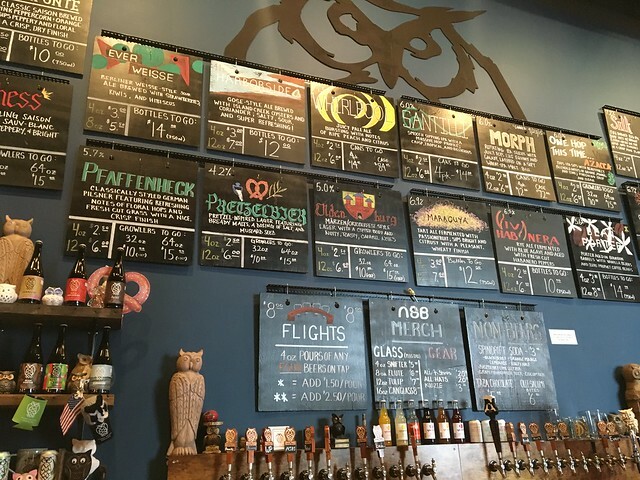 I made a quick decision to visit the brewery when I got the chance. 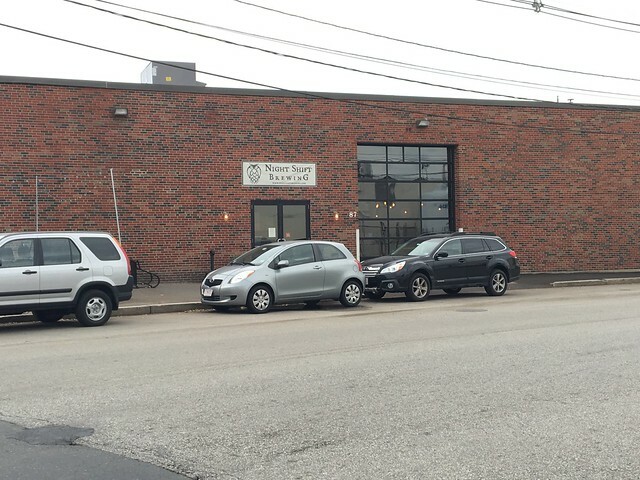 It's another brewery that was a little ways away - after my T stop, I walked a little over a mile to get here. 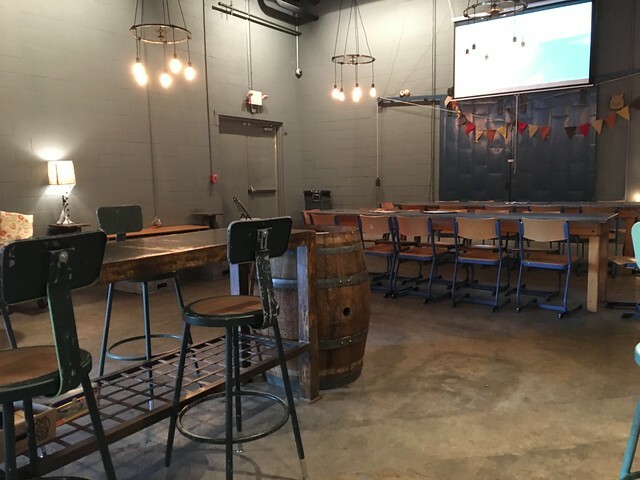 I ventured to the 15 Ward Street location (the brewery and taproom), as opposed to the beer garden because I wanted to check out the actual brewery. They had just opened (I was trying to be efficient and cram as much into this day as I could), so I was the only one there. 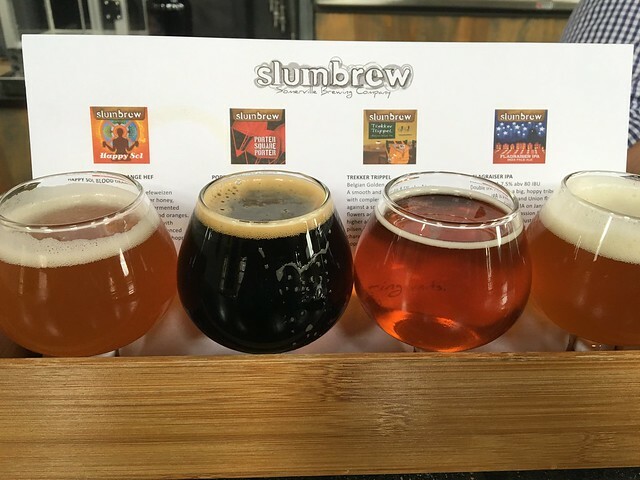 I ordered a flight of their flagship beers - Happy Sol Blood Orange Hef, Porter Square Porter, Trekker Trippel, and Flagraiser IPA. The Happy Sol was tasty and a bit sour. And citrusy. The porter was a stark contrast - deeper, roasty. The trippel was pretty tasty - a little spice there and a bit hoppier. Then the flagraiser was much hoppier - a bit too much for my palate. 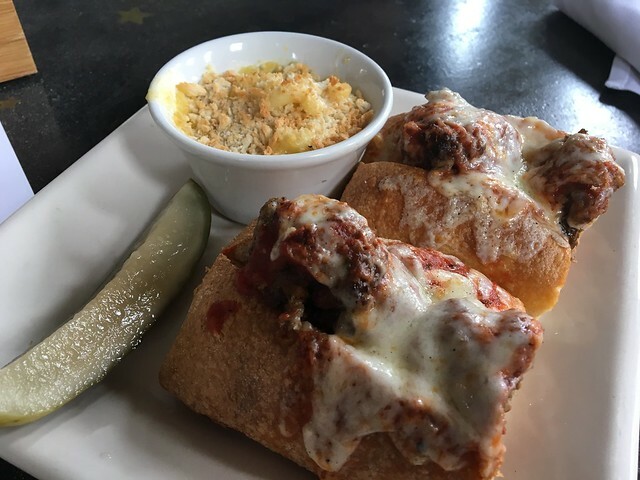 I also ordered the housemade meatball sandwich, which is "Jeff's Favorite." This was just OK. The meatballs could've been hotter and more moist. The bread was too hard, making it tough to really eat. Maybe more sauce could've helped? The macaroni and cheese was tasty, as was the pickle, though! Overall, a bit of a hike to get here, but decent beer and OK food. In the past few years, "ramen" has become increasingly mainstream. It's no longer just a utilitarian Japanese noodle soup dish. 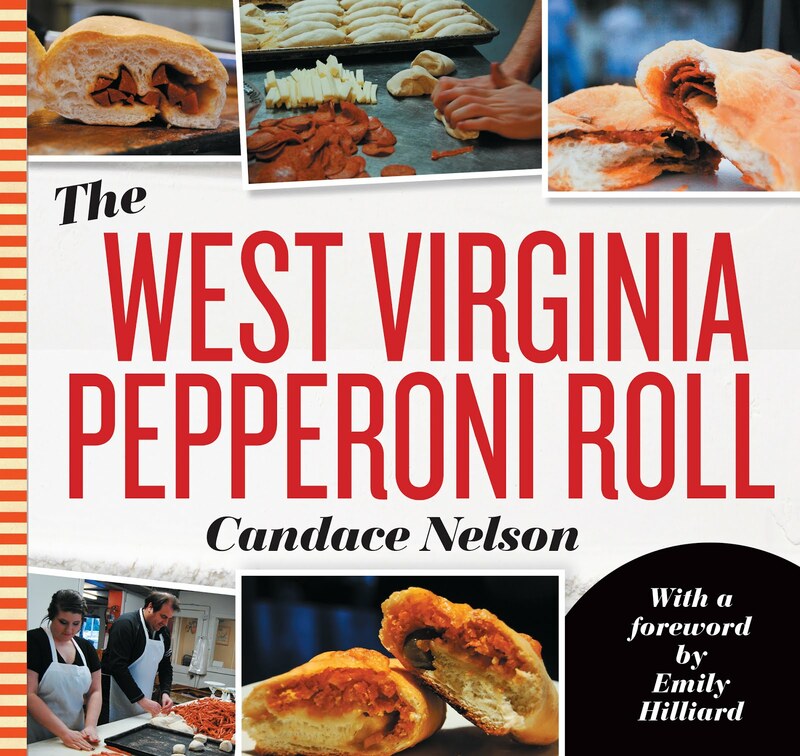 It has formed into this trendy dish popping up all over Western cities. And, no, I'm not talking about the instant ramen mass-produced as a block of dried noodles with an accompanying spice packet that sells for about 20 centers per package. Ramen is the Chinese-style wheat noodles served in a meat-based broth with soy, miso, slices of pork, nori, fish cake and green onions. 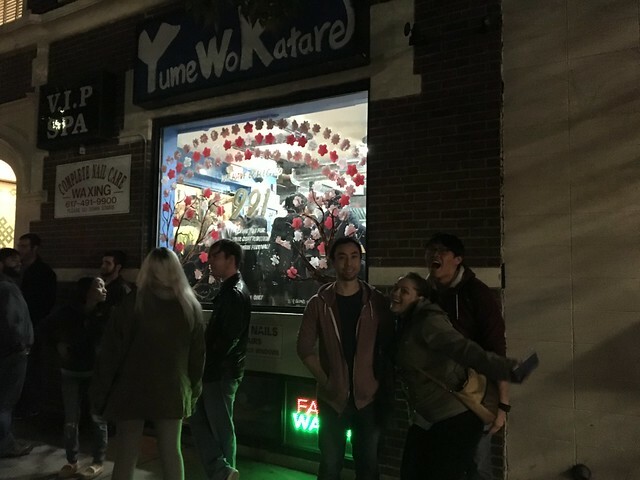 In Boston, Yume Wo Katare is known to have some of the best ramen around. As it should because it literally only serves on item: the pork ramen. You can add extra meat. 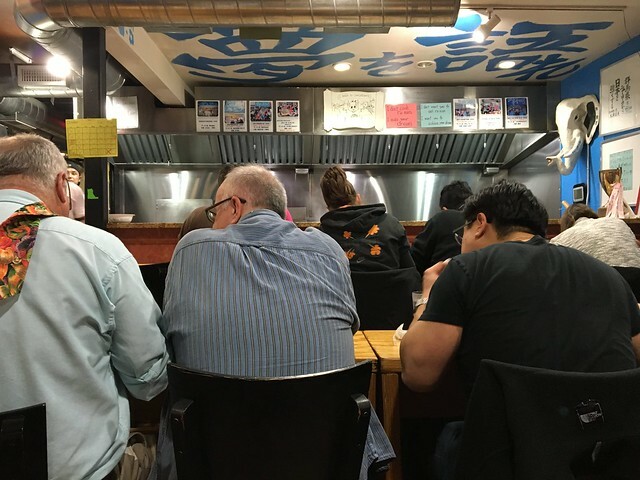 Yume Wo Katare is also cash only, has a long line no matter what time of day and has just three rows of bench seating, where you face the chef and are ultimately judged on how much you are able to eat. It's certainly an experience. After waiting for a long time outside, it was finally our turn to pass through the door. Except, they split our party up into two and two (instead of four) so that it would be more simple to seat us. There are only 18 seats here afterall. We placed our order at the cash register, paid, grabbed our cup and pour a glass of water before shimmying into our place on the bench. Soon after, the other half of our party was seated in the row in front of us. We sit quietly and patiently as some of the people finish up their meals. One of the Yume Wo Katare chefs announces every so often "We gotta Perfect!!" or "It's a Next Time!" dependent upon how much of the ramen was finished. Soon, as the chefs begin to prepare our meals, we were asked if we wanted garlic or not. The answer to that question is always yes. And before long, there is this massive, overwhelming piping hot bowl of ramen. There are a few general types of ramen: shio (pale, clear, yellow, salty broth made with chicken, vegetables fish and seaweed), tonkotsu (a cloudy white broth used by boiling pork bones, fat over high heat for many hours), shoyu (clear brown broth, made with soy sauce so it's tangy, salty and and savory) and miso (contains miso, so it's tangy and slightly sweet). 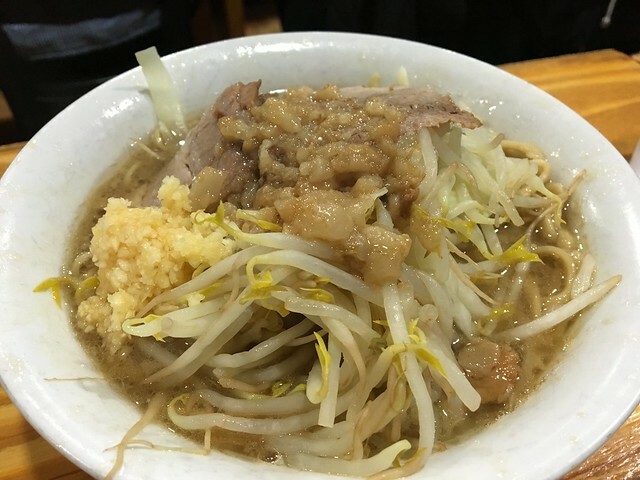 Yume Wo Katare serves jiro ramen, which is a tonkotsu broth with shoyu added. The noodles are very thick and chewy. This giant bowl has a heaping ton of thick noodles in a fatty broth with a few tender pieces of pork belly, mixed in with bean sprouts, bok choy and lots of minced garlic. I love the thick, chewy noodles, and the broth, while salty, was very good. I slurped up my soup, alternating between my chopsticks and spoon. It is a method that takes some practice, but I entered into a rhythm. But after I finished all my noodles, it felt like there was a rock in my belly. I looked down to see a full bowl of broth and some pork left. 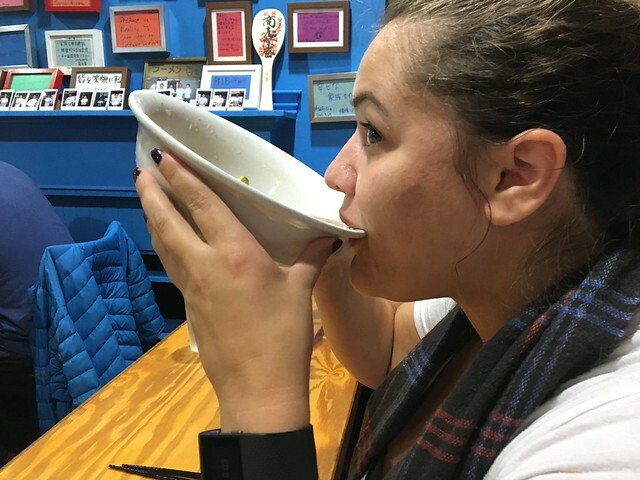 I took a few spoonfuls of just the broth - but there's no way I could hold all that in. It's so rich and fatty and greasy - and without the noodle to cut through it, it just wasn't going to happen. I took a break, hoping to make room in my belly - regretting everything I ate earlier in the day. There was so much pressure! They announce to everyone how you did! I wanted to do well! Unfortunately, when it was my turn to be judged, I received an "Almost!" That's better than a "Next Time!" so I was actually proud of myself. Even though the other three members of my group all got "Perfect!" 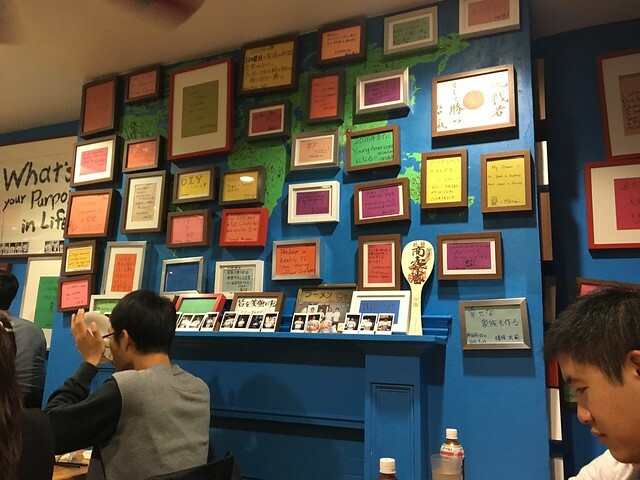 At the end of the meal, you're allegedly encouraged to "share your dream," and there are signs hanging up of previous patrons' dreams. This didn't happen while I was there, but it is apparently a big part of the experience. 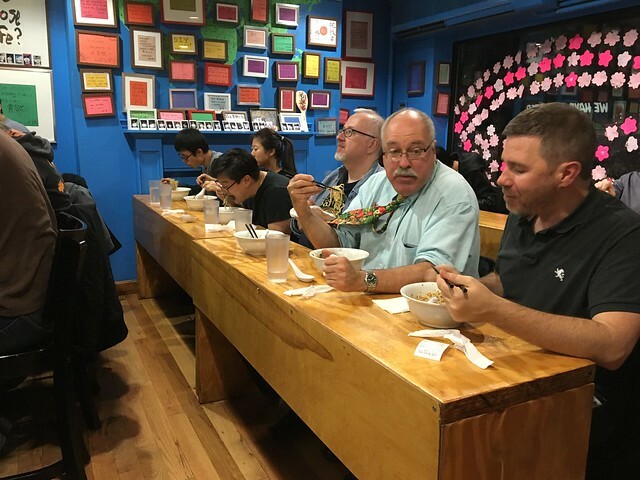 You're encouraged to be quiet and focus on your ramen - apparently as a symbol of what you can accomplish - and if you finish your ramen, you can accomplish your dream. My only dream at that moment was to keep everything I just ingested inside of me. This was the first time I ever ate so much, I was genuinely concerned I might throw up. We thankfully had about maybe a half mile or so walk back to the apartment so I could try to get some of that to settle. This isn't a casual, carefree light dinner. It's a TON of food, it's almost served militant style, and there's pressure to perform. That said, it's also fun. Just be sure to get mentally prepared first. While in Boston, I wanted to check out Harvard. I walked around the Cambridge campus, noticing that there are tons of tourists at this college. TONS. You don't typically see tourists at WVU - just current or prospective students. Lots of folks were taking photos with the statue of John Harvard and rubbing his left shoe for luck. 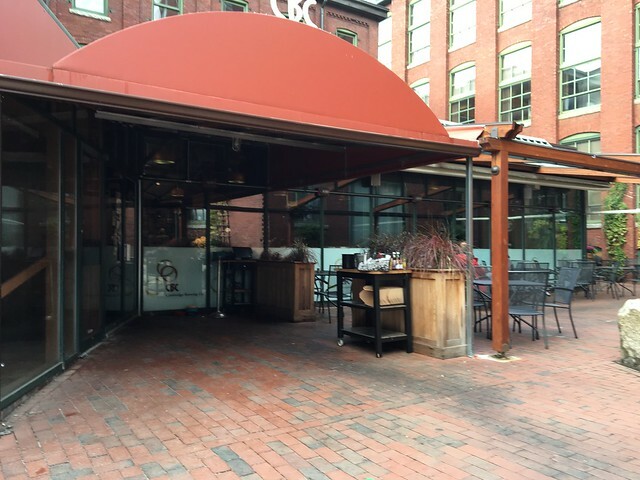 After Harvard, I found my way to Cambridge Brewing Company for some grub. 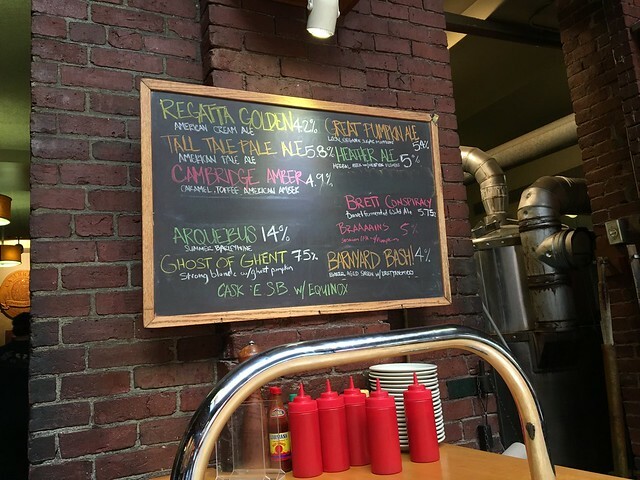 Sitting at the bar, I looked up to the beer list on the wall and decided on the Cambridge Amber. Seems standard. 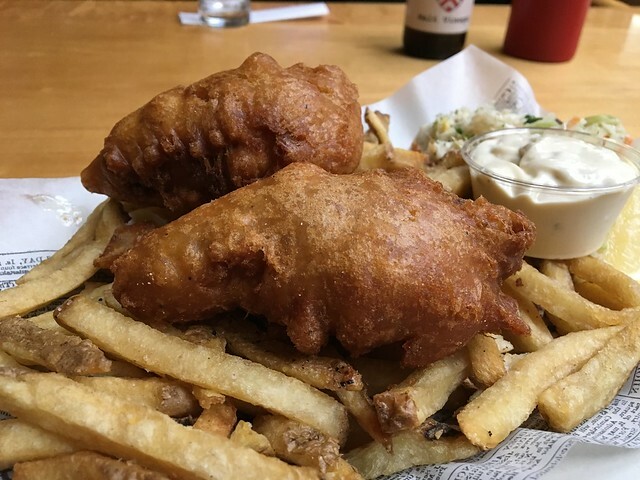 For food, I went for the fish and chips. The beer was good - easy, drinkable, smooth. Fairly standard amber ale. The fish and chips was OK - the breading was overwhelming for the actual fish. There was more crunch and pieces falling apart than there was actual fish inside. BUT, the fish itself, when I got to it, wasn't bad. Overall, a decent standard beer and an OK plate of food. 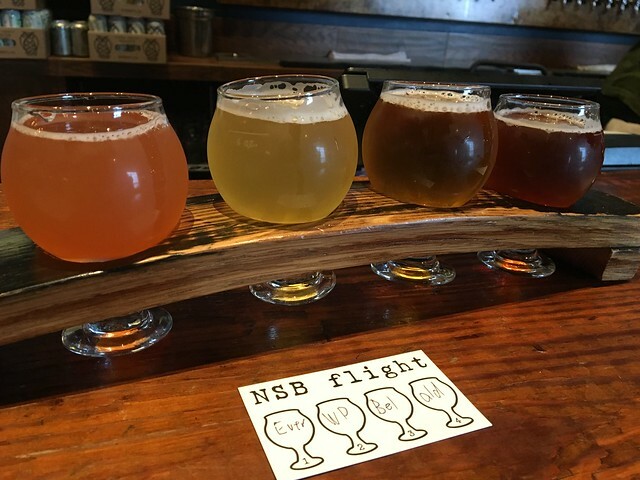 Night Shift Brewing is located a good way from downtown Boston, where most of my adventures were taking place. In fact, I had to take the Orange Line all the way to the end and then walk another 3/4 of a mile or so to get there. But it was totally worth it. 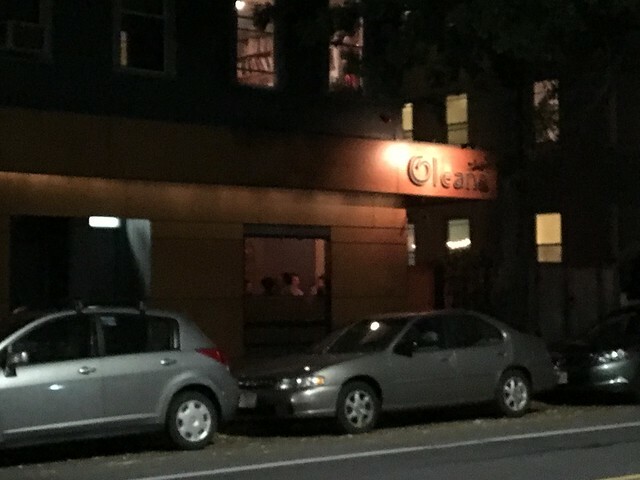 Walking inside, I was a bit intimidated that it might be a boys' club, but there were not too many people there. I sidled up to the bar and took a look at all the hand-written chalkboards denoting the character of the individual beers. 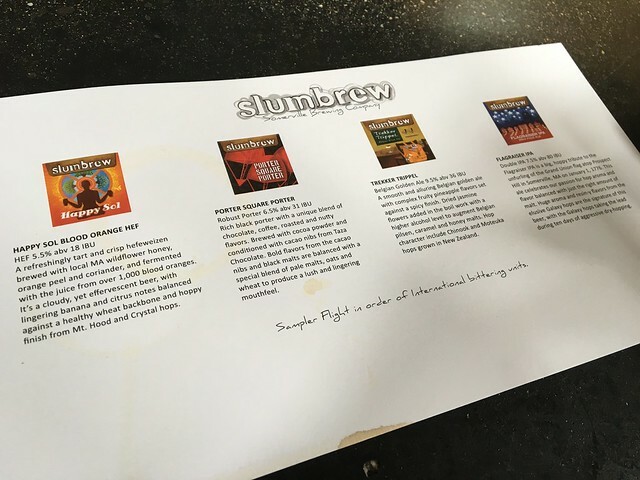 My favorite kind of beers are sour beers, and I loved that they had a special section just for them. The bartender who waited on me was incredible. He was talking to me to figure out what kinds of beers I like to see what I should add to my flight. And, he spent some time in West Virginia. So, I felt right at home here. He hooked me up Ever Weiss (sour ale aged with strawberries, kiwi and hibiscus), Whirlpool (soft pale ale bursting with notes of ripe peach and citrus), Belafonte (classic saison brewed with pink peppercorns and orange peel; sips peppery and floral with a crisp, dry finish), and the Oldenburg (Marzen/Oktoberfest style lager with a copper body and nutty, toasty, caramel notes). I loved every single one of these. The strawberry/kiwi one was very sour but fruity, and I loved it. The Whirlpool and Belafonte were both good, easy beers. And the Oldenburg was very nice, considering I was drinking this in the fall. This is definitely in my top favorite breweries ever. I would definitely go back if I had the chance to do so. I went to SO. MANY. 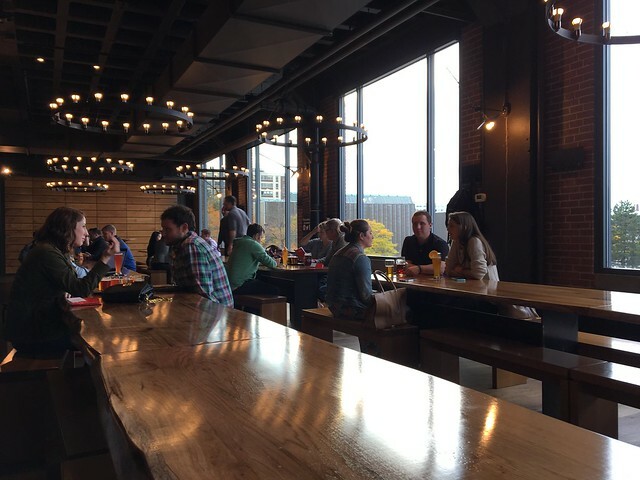 BREWERIES. in Boston. 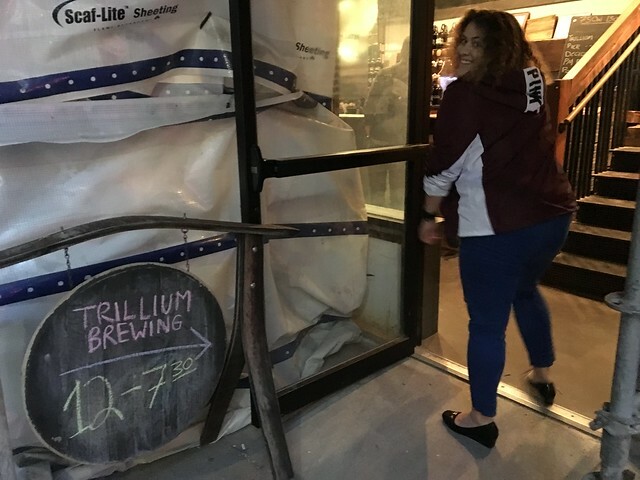 Let's chat briefly about the easiest one: Trillium Brewing. 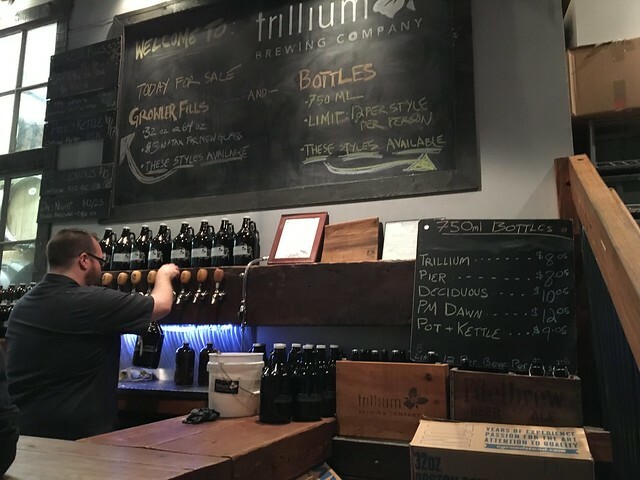 Trillium doesn't have so much of a tasting room (no samples here) as it does a growler fill station & bottles for purchase. 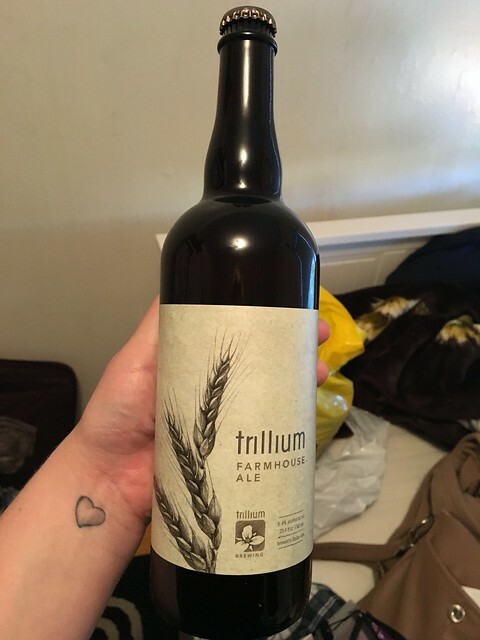 After finally finding the space, we got in line and purchased a 750 ml of Trillium - a farmhouse ale and the namesake of the brewery. I figured this would be the flagship beer, so I wanted to try it. It's wheaty with a bit of spice. Not bad. 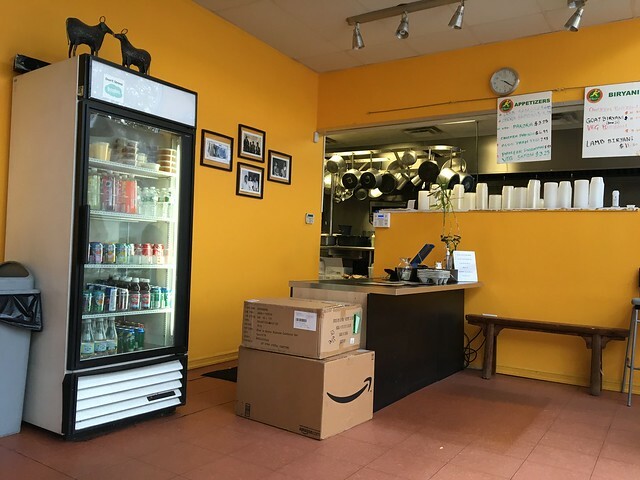 While running some errands, Kaitlynn pointed out D'Guru Restaurant, an Indian restaurant and caterer she used to frequent when she lived on that side of town. She loved their kheer (something I love) and said how often she used to get it. Me: "We should try it!" Kaitlynn: "Really? We are supposed to get dinner soon." Me: "But I'm really hungry now. We can just get a snack?" 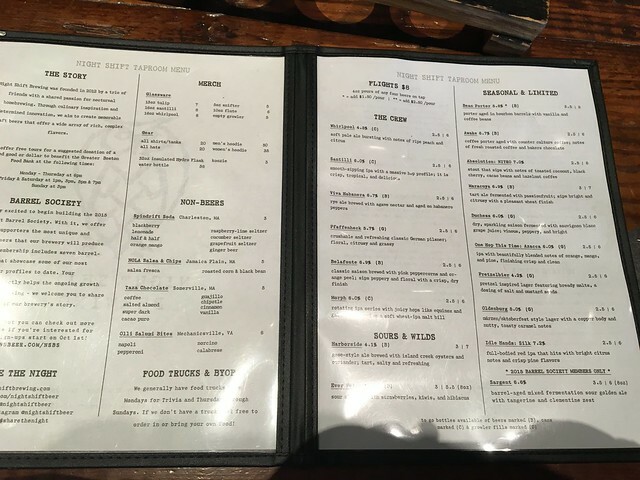 So, we walked in and looked over the menu briefly. 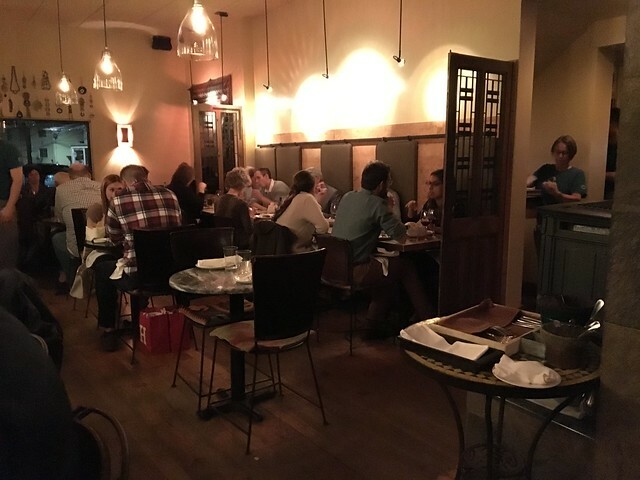 There isn't really much of a dining space - I think one or two tables available. 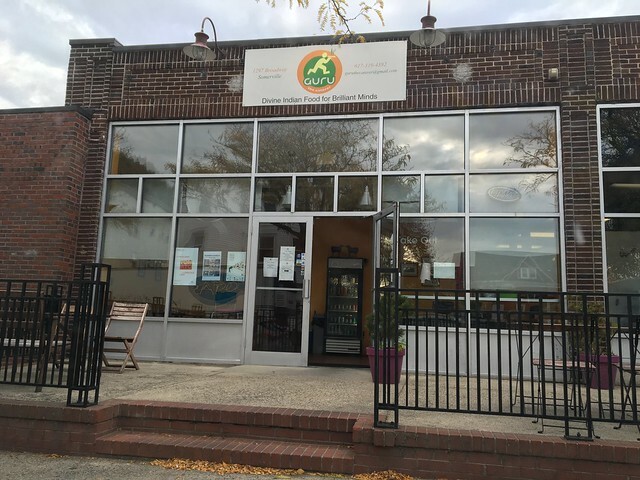 I think the main focus is on the catering, but they do have a full menu of options to purchase - chicken tikka masala, goat curry, paneer, samosa, pakora. 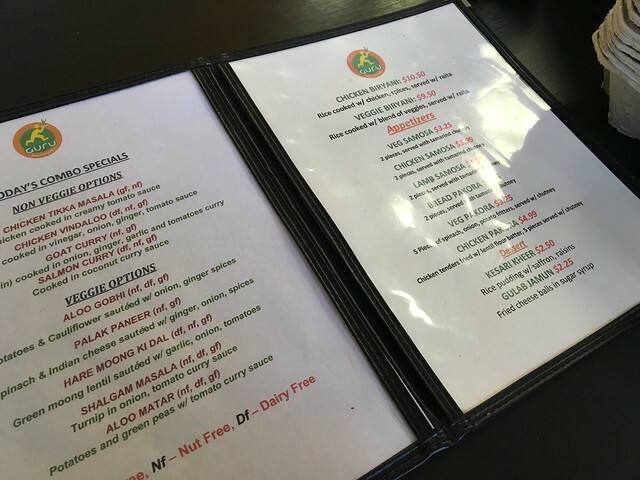 I ordered a thing of the kheer, gulab jamun and veggie pakora - which really, is what I would order at every place if I wouldn't get ridiculous looks. Kheer, which had saffron and raisins, was delicious. It had a hint of different herb I wasn't familiar with. It was delicious. Gulab jamun was also very good. It was cold, so it was pretty firm. A little warmth would've helped loosen up the syrup and spongey cheese ball. Who knew fried cheese balls covered in a sugar syrup could be so delicious? Actually, that's a dumb question, of course that would be delicious. 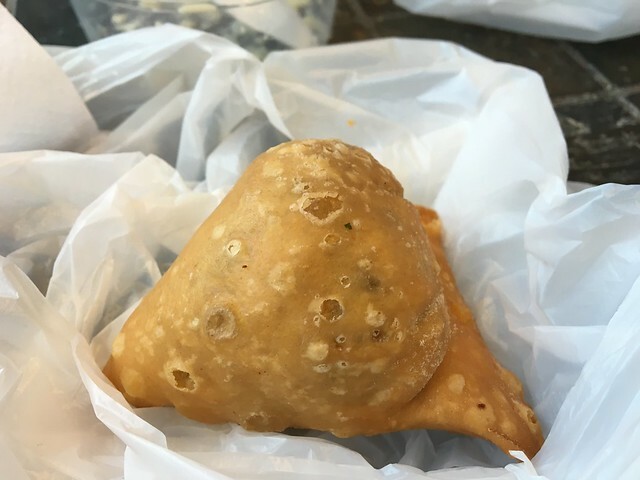 Kaitlynn got some samosas, while I devoured my veggie pakoras. 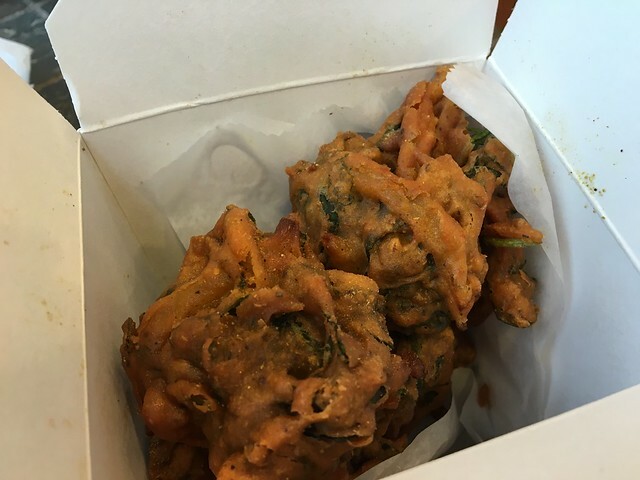 It was five pieces of fried spinach, onion, potato fritters served with chutney. They were so delicious and huge. A more manageable piece would've been welcome (and a little less grease), but still, good. 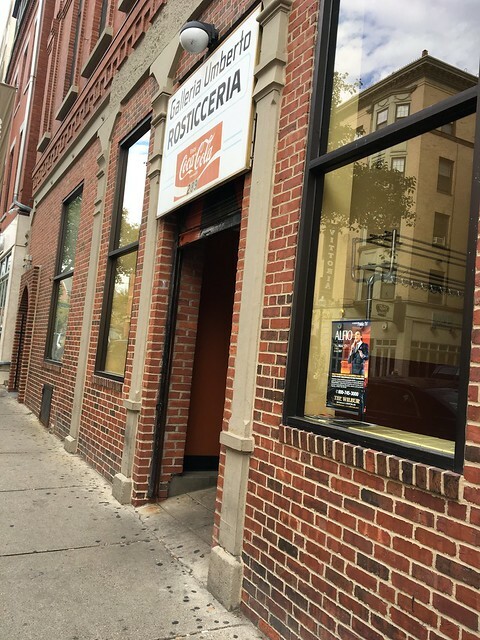 Boston has a "Little Italy" section of the city, known as The North End. 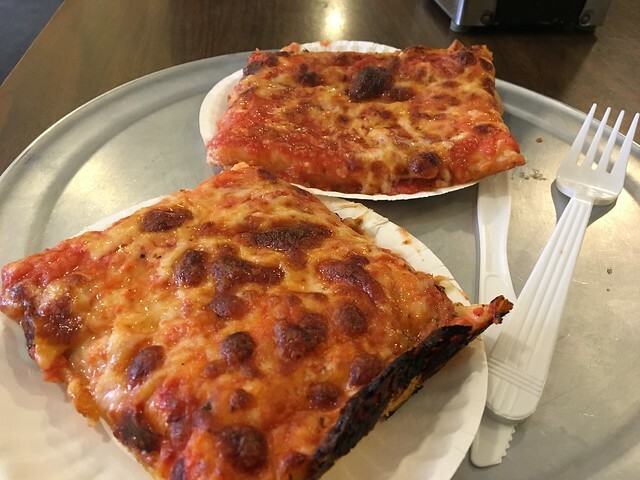 Galleria Umberto, a cash-only counter that dishes out Sicilian-style pizza until it runs out, is one often overlooked. 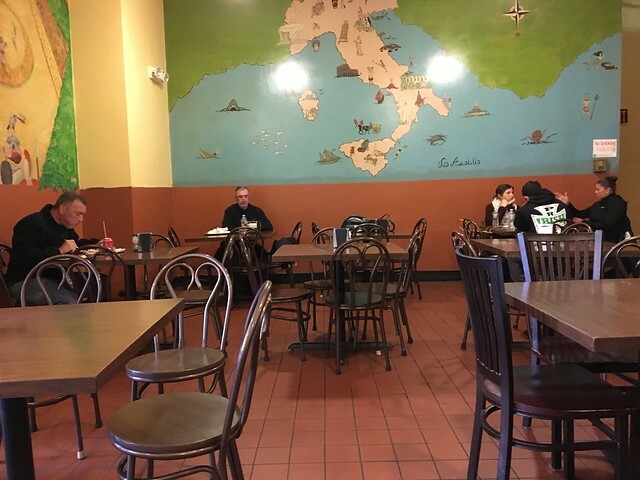 The front is fairly nondescript, but inside, there is a large dining space with a mural of Italy on the wall. 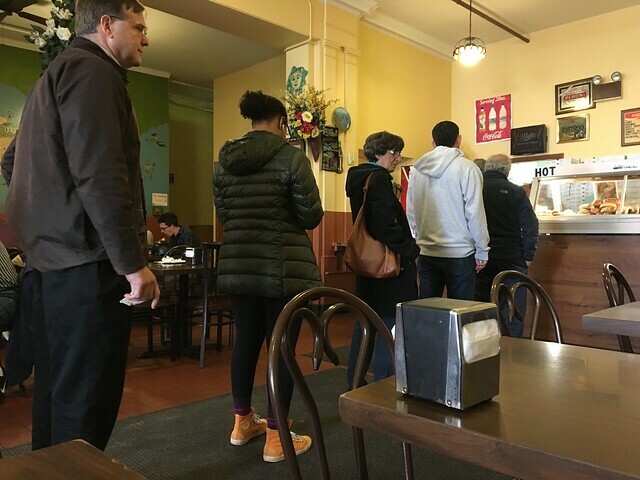 There was already a line waiting to reach the counter during early lunch hours. 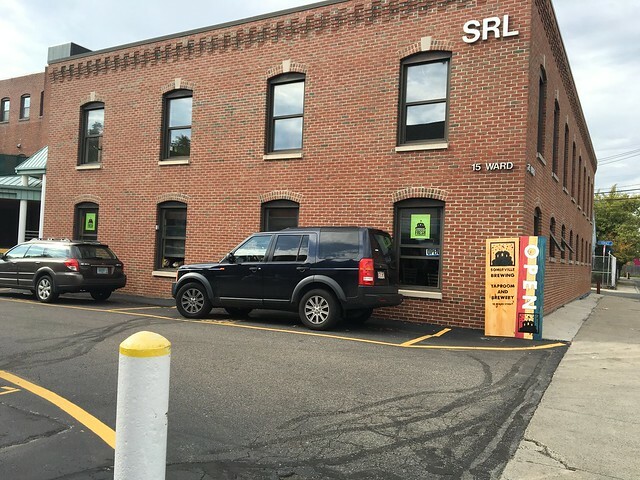 It is open Mondays through Saturdays from 11 a.m. until the dough runs out - usually before mid-afternoon; early on the weekends. I only waited a few minutes, really, before reaching the counter. 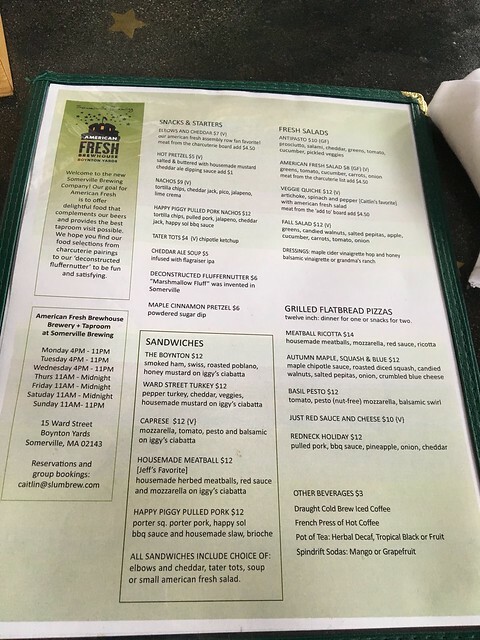 The menu is simple - plain Sicilian slices, arancini (large, fried balls of risotto baked until golden brown with sharp cheese and ground beef), panzarotti (large tater tots with a mozzarella center), panini and calzones. I ordered two Sicilian slices and a water. Folks behind the counter engaged in a sort of seamless dance where they weaved in and out of each others' way to plate pieces and scoop arancini. Some customers received a bit lengthier conversation, but mine was short and sweet, and I found a seat along the wall to dive into these hefty square slices. The crust is thick, completely crisp and provides a cushiony bed for a hearty red sauce to sink in. Mozzarella cheese blanketed and bubbled up into golden brown pockets. The combination made for a very delicious slice. And I know most people think they only like thin slice pizza, but until you've had something this tasty, don't knock it.